Cosmologists at UCL are a step closer to determining the mass of the elusive neutrino particle, not by using a giant particle detector, but by gazing up into space. Although it has been shown that a neutrino has a mass, it is vanishingly small and extremely hard to measure - a neutrino is capable of passing through a light year (about six trillion miles) of lead without hitting a single atom. New results using the largest ever survey of galaxies in the universe puts total neutrino mass at no larger than 0.28 electron volts - less than a billionth of the mass of a single hydrogen atom. This is one of the most accurate measurements of the mass of a neutrino to date. The research is due to be published in an upcoming issue of the journal Physical Review Letters, and will be presented at the Weizmann:UK conference at UCL on 22-23 June 2010. It resulted from the PhD thesis of Shaun Thomas, supervised by Prof. Ofer Lahav and Dr. Filipe Abdalla. Professor Ofer Lahav, Head of UCL's Astrophysics Group, said: "Of all the hypothetical candidates for the mysterious Dark Matter, so far neutrinos provide the only example of dark matter that actually exists in nature. It is remarkable that the distribution of galaxies on huge scales can tell us about the mass of the tiny neutrinos". The work is based on the principle that the huge abundance of neutrinos (there are trillions passing through you right now) has a large cumulative effect on the matter of the cosmos, which naturally forms into "clumps" of groups and clusters of galaxies. As neutrinos are extremely light they move across the universe at great speeds which has the effect of smoothing this natural "clumpiness" of matter. By analysing the distribution of galaxies across the universe (i.e. the extent of this "smoothing-out" of galaxies) scientists are able to work out the upper limits of neutrino mass. Dr. Shaun Thomas commented: "Although neutrinos make up less than 1% of all matter they form an important part of the cosmological model. It's fascinating that the most elusive and tiny particles can have such an effect on the Universe." Dr. Filipe Abadlla added: "This is one of the most effective techniques available for measuring the neutrino masses. This puts great hopes to finally obtain a measurement of the mass of the neutrino in years to come." The authors are confident that a larger survey of the Universe, such as the one they are working on called the international Dark Energy Survey, in which UCL is heavily involved, will yield an even more accurate weight for the neutrino, potentially at an upper limit of just 0.1 electron volts. The work was funded in part by the Science and Technologies Facilities Council and the Royal Society. 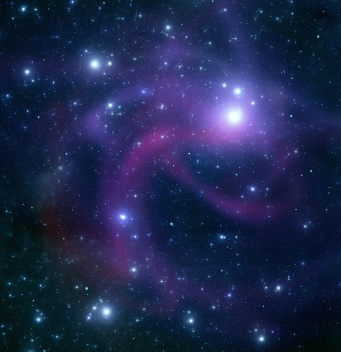 This Making Connections two-day Symposium at UCL provides an opportunity for scientists to present new research in the fields of Cosmology and Particle Astrophysics. Leading scientists from the Weizmann Institute will be joined by colleagues from UK universities to present their latest research in Particle Physics, Theoretical Cosmology, Dark Matter, Dark Energy and Galaxy formation.